The butchering of dogs for meat is not a problem solely found overseas. In the United States, 44 states allow dogs to be raised and sold for meat, with only Virginia, California, Hawaii, New York, Georgia, and Michigan having laws that prevent such practices, classifying the consumption of dog meat as animal cruelty. Recently, the Pennsylvania legislature failed to pass a law that would ban the raising and slaughtering of cats and dogs for meat. Due to unclear and porous state laws, it is legal to sell and consume dog and cat meat, and also legal to raise them for that purpose. According to the Humane Society, puppy mills are raising dogs that are sold to butchers around the country as a delicacy. These dogs are raised under horrific conditions. The barbaric and cruel practice of eating household pets is denounced around the world, yet it still happens in our backyard. This practice cannot continue! The federal government needs to step in and ban the practice of eating dog and cat meat and the slaughter of these innocent animals for consumption. Urge the FDA to put a stop to this practice by recognizing the raising and consumption of household pets as animal cruelty! Tell the FDA stop the slaughter of these innocent animals! Comedian Stephen Colbert helped bring attention to this ugly practice on his show, which you can see below. With national attention finally being shed on the meat trade, it is time to end it! I am outraged that the slaughter of domestic animals such as dogs and cats for the meat trade is legal in nearly every state. According to the Humane Society, the dogs and cats bred for consumption are often raised under horrific conditions in puppy mills. They are then sent to butchers to be slaughtered and sold to consumers. With no oversight from the USDA, the meat can often pose a health risk to the public as well. The majority of the Western world has outlawed the sale and consumption of dog meat, yet this barbaric practice is still very much alive in the United States. Dog meat is being marketed as a delicacy in butcher shops and restaurants around the country, but you can help to protect our pets by ending this cruel, disgusting practice. Help us protect pets from becoming food! Please recognize this terrible practice as the animal cruelty it is and ban the slaughter, sale, and consumption of cat and dog meat in the United States. 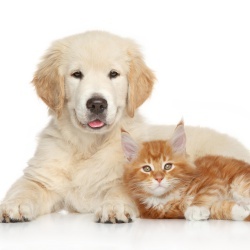 Recently, the Pennsylvania legislature failed to pass a law that would ban the raising and slaughtering of cats and dogs for meat. Comedian Stephen Colbert helped bring national attention to it, and now it's time to end it! That's 52,644 signatures! Let's keep the ball rolling.